First begin by toasting the rice in either a frying pan or wok. When the rice changes in colour to a warm brown and gives off a fragrance, remove from heat. Transfer into a mortar with the pinch of salt and pound down until you make a fine powder. Pan fry the steak with a until medium rare. Leave to rest for 5 minutes. Mix together the dressing ingredients. Add the ginger and sesame oil and set aside. Arrange the lettuce leaves, radishes and cucumber on a large serving platter. 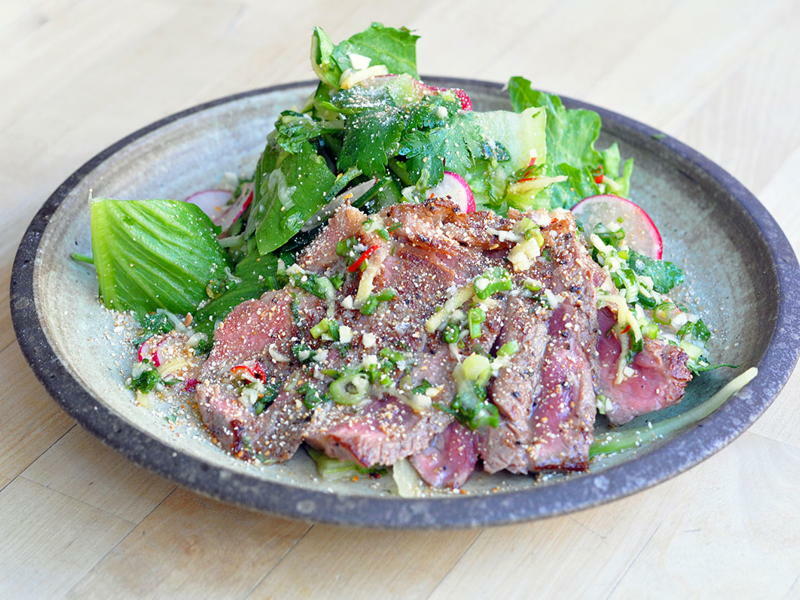 Thinly slice the beef and place on the salad. Drizzle over the dressing, scatter with spring onions and herbs and serve garnised with the roasted rice.